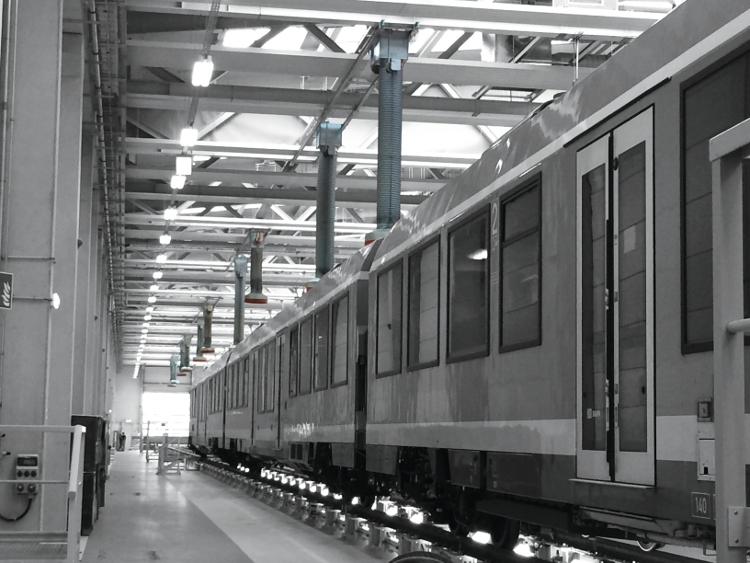 When a new fleet of 23 diesel trains was introduced on the Berlin to Rummelsburg service in Germany, our partner firm, Blaschke, was asked to install its innovative exhaust extraction systems on two tracks at the local maintenance facility. Because the exhaust gases omitted by diesel trains are hazardous, they need removing safely during maintenance. The air cross-flows in depots, meaning direct capture is the only effective way to ensure fumes don’t leak into the working environment . ICE trains have four exhaust stacks, offset diagonally, that can vary in distance by up to two metres. Therefore, Blaschke was asked to install two systems with four extract units per road, allowing several vehicles to be serviced simultaneously. A six metre multi rail system was attached to the roof of the depot at right angles to the trains. As an overhead line runs over the middle of the tracks, appropriate interlocking and security measures were needed to avoid the two becoming entangled. The extract units can be positioned over the exhaust stacks manually or automatically, via remote control. One 15kW extraction fan per road then channels the hazardous gases outside through 400mm collector ductwork.